Bazoches. Heart at Les Invalides. Sébastien Le Prestre de Vauban, Seigneur de Vauban and later Marquis de Vauban (1 or 4 May 1633 – 30 March 1707), commonly referred to as Vauban, was a Marshal of France and the foremost military engineer of his age. He is known for his skill in both designing fortifications and breaking through them; his ideas, starting from Pagan's "Les Fortifications", were the dominant model of siegecraft and fortification for nearly 100 years. He also advised Louis XIV on how to consolidate France's borders, to make them more defensible. 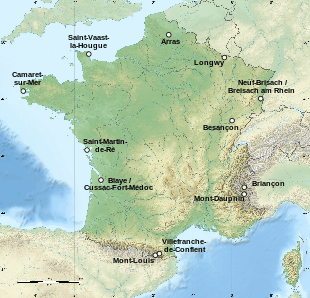 Vauban made a radical suggestion of giving up some land that was indefensible to allow for a stronger, less porous border with France's neighbours. Three parallel trenches interconnected by zigzagging communication trenches to avoid direct shots. Each trench brings the infantry across the whole width of the leading edge; the first is out of range of the defenders and can withstand an assault from the rear; the third is at the foot of the glacis. Redoubts protect the ends of each trench. Vauban was born in Saint-Léger-de-Foucheret (renamed Saint-Léger-Vauban in his honour in 1867), in Burgundy France, into a family of minor nobility. At the age of ten he was left an orphan in very poor circumstances, and his boyhood and youth were spent amongst the peasantry of his native place. After some time he was put under the care of the Carmelite prior of Semur, who undertook his education, and the grounding in mathematics, science and geometry which was important in his subsequent career. At the age of seventeen Vauban joined the regiment of Condé in the war of the Fronde. He received the offer of a commission within a year, which he declined on account of poverty. Condé then employed him to assist in the fortification of Clermont-en-Argonne. Soon afterwards he was taken prisoner by the royal troops; but though a rebel he was well-treated, and the kindness of Cardinal Mazarin converted the young engineer into a devoted servant of the king. He was employed in the siege of Sainte-Menehould (which he had helped to storm as a Frondeur) and won a lieutenancy in the regiment of Burgundy, and at Stenay he was wounded twice. Soon afterwards he besieged and took his own first fortress, Clermont; and in May 1655 he received his commission as an ingénieur du roi, having served his apprenticeship under the Chevalier de Clerville, one of the foremost engineers of the time. Between that year and the peace of 1659 he had taken part in or directed ten sieges with distinction, had been wounded several times, and was rewarded by the king with the free gift of a company in the famous Picardy regiment. About this time he married a cousin, Jeanne d'Aulnay. After the peace, Vauban was put in charge of the construction of several important defences, amongst other places at Dunkirk, where his work continued until the year before his death. On the renewal of war in 1662 he conducted, while the king was present, the sieges of Douai, Tournai and Lille. During the siege of Lille he so distinguished himself that he received a lieutenancy in the guard (ranking as a colonelcy). The peace of Aix-la-Chapelle confirmed France's possession of new fortresses, which Vauban now improved or rebuilt. Hitherto the characteristic features of his methods of fortification had not been developed, and the systems of preceding engineers were faithfully followed. Colbert and Louvois were profoundly interested in the work, and it was at the request of the latter that the engineer drew up in 1669 his Mémoire pour servir à l'instruction dans la conduite des sièges (this, with a memorandum on the defence of fortresses by another hand, was published at Leiden in 1740). On the renewal of war Vauban again conducted the most important sieges, (Rheinberg and Nijmegen 1672, Maastricht and Trier 1673, Besançon 1674). In the latter year he also supervised the only defence in which he ever took part, that of Oudenaarde. This was followed by the reduction of Dinant, Huy and Limbourg. At this time he wrote for the commandants of Verdun and Le Quesnoy, valuable Instructions pour la défense. In 1675 Vauban bought the Château de Bazoches. In 1676 he was made Maréchal de camp. He took Condé, Bouchain and other places in that year, Valenciennes and Cambrai in 1677, Ghent and Ypres in 1678. It was at this time that Vauban synthesized the methods of attacking strong places, on which his claim to renown as an engineer rests far more than on his systems of fortification. The introduction of a systematic approach by parallel series of trenches (said to have been suggested by the practice of the Turks at Candia in 1668) dates from the siege of Maastricht, and in principle remained until the 20th century the standard method of attacking a fortress. The Peace of Nijmegen gave more territory to France, and more fortresses had to be adapted. Vauban was named Commissaire-général des fortifications on the death of Clerville, and wrote in 1679 a memorandum on the places of the new frontier, from which it appears that from Dunkirk to Dinant France possessed fifteen fortresses and forts, with thirteen more in second line. Most of these had been rebuilt by Vauban, and further acquisitions, notably Strasbourg (1681), involved him in unceasing work, some of which, such as the Barrage Vauban, can still be seen today. At Saarlouis for the first time appeared Vauban's "first system" of fortification, which remained the accepted standard until comparatively recent times. He never hesitated to retain what was of advantage in the methods of his predecessors, which he had hitherto followed, and it was in practice rather than in theory that he surpassed them. 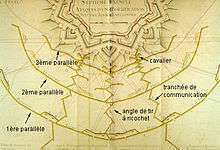 In 1682 his "second system", which introduced modifications of the first designed to prolong the resistance of the fortress, began to appear; and about the same time he wrote a practical manual entitled Le Directeur-Général des fortifications (Hague, 1683–85). Having now attained the rank of Lieutenant Général, he took the field once more, and captured Kortrijk in 1683, and Luxembourg in the following year. The unexpected strength of certain towers designed by the Spanish engineer Louvigni (fl. 1673) at Luxemburg suggested the tower-bastions which are the peculiar feature of Vauban's second system which was put into execution at Belfort in the same. In 1687 he chose Landau as the chief place of arms of Lower Alsace, and lavished on the place all the resources of his art. But side by side with this development grew up the far more important scheme of attack. He instituted a company of miners, and the elaborate experiments carried out under his supervision resulted in the establishment of all the necessary formulae for military mining (Traité des mines, Paris, 1740 and 1799; Hague, 1744); while at the siege of Ath in 1697, having in the meanwhile taken part in more sieges, notably that of Namur in 1692 (defended by the great Dutch engineer Coehoorn), he employed ricochet firing for the first time as the principal means of breaking down the defence. He had indeed already used it with effect at Philippsburg in 1688 and at Namur, but the jealousy of the artillery of outside interference had hindered the full use of this remarkable invention, which with his other improvements rendered the success of the attack almost certain. 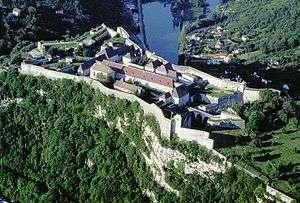 After the peace of Ryswick Vauban rebuilt or improved other fortresses, and finally Neuf-Brisach, fortified on his "third system " which was in fact a modification of the second and was called by Vauban himself système de Landau perfectionné (perfected Landau system). 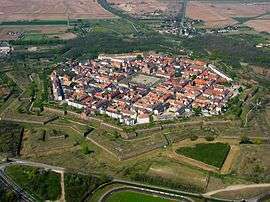 His last siege was that of Old Breisach in 1703, when he reduced the place in a fortnight. On 14 January of that year Vauban had been made a Maréchal de France, a rank too exalted for the technical direction of sieges, and his active career came to an end with his promotion. Soon afterwards appeared his Traité de l'attaque des places, a revised and amplified edition of the older memoir of 1669, which contains the methods of the fully developed Vauban attack, the main features of which are the parallels, ricochet fire and the attack of the defending personnel by vertical fire. 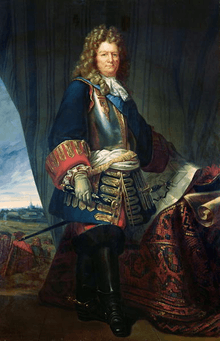 But Louis XIV was now thrown on the defensive, and the war of the Spanish Succession saw the gradual wane of Vauban's influence, as his fortresses were taken and retaken. The various captures of Landau, his chef-d'oeuvre, caused him to be regarded with disfavour, for it was not realized that the greatness of his services was rather in the attack than in the defence. In the darkness of defeat he turned his attention to the defence; but his work De la defense des places (ed. by General Valaze, Paris, 1829) is of far less worth than the Attaque, and his far-seeing ideas on entrenched camps (Traits des fortifications de campagne) were coldly received, though therein may be found the elements of the "detached forts" system universal in Europe by the 20th century. Although indispensable to Louis XIV, Vauban boldly stretched his goodwill on several occasions. In 1685, Vauban vocally condemned the repeal of the edict of Nantes. It appears that his opposition was based mostly on economic grounds. In the 1690s, he conducted a comprehensive census of Flanders and other areas of France, which earned him his nickname as the "French Petty". A prolific writer on many subjects, including forestry, selective breeding of domestic pigs, monetary policy, and colonisation, Vauban was made an honorary member of the French Academy of Sciences. Applying his knowledge, he even correctly estimated and plotted out the growth of Canada, predicting that its population would be about 30 million by the year 2000. Dismayed by the inefficiency of the French fiscal system, and deeply impressed with the deplorable condition of the peasantry whose labor he regarded as the main foundation of all wealth, Vauban's 1707 tract, Projet d'une dixme. royale, protested against the unequal incidence of taxation and the exemptions and privileges of the upper classes; the tract called for the repeal of all taxes and the imposition of a single 10% tax (dixme. royale) on all agricultural output (payable in kind) and on income from trade and manufactures, with no exemptions. He backed up his argument with a mass of statistics. His book was condemned by the royal government because it had been published without royal permission. Vauban spent the last weeks of his life trying to collect every copy that he had disseminated privately to friends and acquaintances. Nevertheless, his ideas inspired later Enlightenment economists, such as Forbonnais, Mirabeau and the Physiocrats. Vauban died in Paris, of an inflammation of the lungs. During the French Revolution his remains were scattered, but in 1808 his heart was found and deposited by order of Napoléon in the church of Les Invalides. Between 1667 and 1707, Vauban upgraded the fortifications of around 300 cities, including Antibes (Fort Carré), Arras, Auxonne, Barraux, Bayonne, Belfort, Bergues, Citadel of Besançon, Bitche, Blaye, Briançon, Bouillon, Calais, Cambrai, Colmars-les-Alpes, Collioure, Douai, Entrevaux, Givet, Gravelines, Hendaye, Huningue, Joux, Kehl, Landau, Le Palais (Belle-Île), La Rochelle, Le Quesnoy, Lille, Lusignan, Le Perthus (Fort de Bellegarde), Luxembourg, Maastricht, Maubeuge, Metz, Mont-Dauphin, Mont-Louis, Montmédy, Namur, Neuf-Brisach, Perpignan, Plouezoc'h (French) (Château du Taureau) (French), Rocroi, Saarlouis, Saint-Jean-Pied-de-Port, Saint-Omer, Sedan, Strasbourg, Toul, Valenciennes, Verdun, Villefranche-de-Conflent (town and Fort Liberia), and Ypres. He directed the building of 37 new fortresses, and fortified military harbours, including Ambleteuse, Brest, Dunkerque, Freiburg im Breisgau, Lille (Citadel of Lille), Rochefort, Saint-Jean-de-Luz (Fort Socoa), Saint-Martin-de-Ré, Toulon, Wimereux, Le Portel, and Cézembre. As part of the fortification of Strasbourg, Vauban was also responsible for the building, in 1682, of the Canal de la Bruche, a 20-kilometre (12 mi) canal intended to improved the supply of building materials to the fortification works. 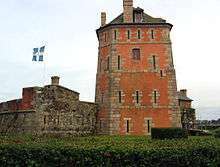 The UNESCO lists 12 fortifications of Vauban as a UNESCO World Heritage Site. 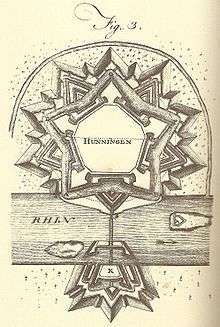 Vauban's fortification of Huningue on the Rhine. Menno van Coehoorn: Vauban's principal rival. ↑ "La gestion du Canal de la Bruche" [The management of the Canal Bruche] (in French). Conseil Départemental du Bas-Rhin. Archived from the original on 16 September 2015. Retrieved 16 September 2015. This article incorporates text from a publication now in the public domain: Chisholm, Hugh, ed. (1911). "Vauban, Sébastien Le Prestre de". Encyclopædia Britannica. 27 (11th ed.). Cambridge University Press. pp. 951–953. Blomfield, Sir Reginald. Sébastien le Prestre de Vauban, 1663–1707. (1938), the fullest biography in English. Duffy, Christopher (1985). The Fortress in the Age of Vauban and Frederick the Great, 1660-1789. Siege Warfare, Volume II. London: Routledge & Kegan Paul. p. 318. ISBN 0-7100-9648-8. Griffith, Paddy; Dennis, Peter. The Vauban fortifications of France. Oxford: Osprey, 2006 (paperback, ISBN 1-84176-875-8). Halévy, Daniel (1924). Vauban. Builder of Fortresses. London: Geoffrey Bles. p. 256. Hebbert, F.J. Soldier of France: Sébastien le Prestre de Vauban, 1633–1707. New York: P. Lang, 1990 (hardcover, ISBN 0-8204-0890-5). Langins, Jānis. Conserving the enlightenment: French military engineering from Vauban to the revolution (MIT Press, 2004). Lynn, John A. Giant of the grand siècle: the French Army, 1610-1715 (Cambridge University Press, 2006). Ostwald, Jamel. Vauban under Siege: Engineering Efficiency and Martial Vigor in the War of the Spanish Succession (History of Warfare; 41). Leiden: Brill Academic Publishers, 2007 (hardcover, ISBN 90-04-15489-2). Wikimedia Commons has media related to Sébastien Le Prestre de Vauban.